I hate being inefficient, but this is especially true in my kitchen. In our old apartment the kitchen was tiny and only had two feet of counter space. 2 feet! It was hard to work in, but we definitely made the best use of our minimal space. Now that we have a much bigger kitchen we are actually having the opposite problem. Because we have enough room for lots of stuff, we ended up having lots of stuff. And none of it is very efficiently organized. So I decided I would start tackling the kitchen problem. I started with our spices. They were in mismatched bottles on a shelf in our pantry. They took up a lot of room. It wasn’t easy to find the spices we were looking for. Some spices had shaker-tops and some required a measuring spoon. It was all a bit chaotic, so I cleaned it up! Now they are all in the same type of tin, and they’re all easily accessible just inside of the cabinet door! 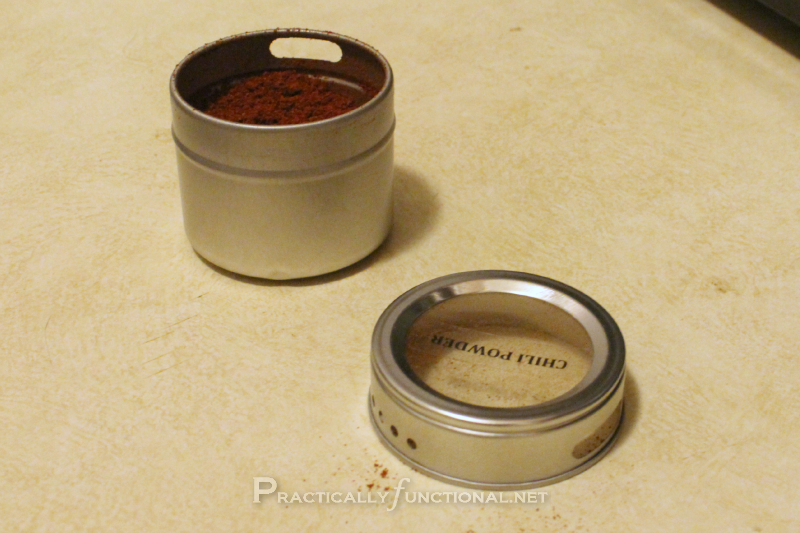 These magnetic-backed tins are designed for spices; the lids have four little holes for shaking out spices, or you can pour them out into a measuring spoon from the big hole. You can also twist the lid backwards so the hole on the tin doesn’t align with either hole in the lid and nothing can come out. You can also turn any regular old tin into a magnetic tin really easily by gluing some magnets onto the bottom of the tin. 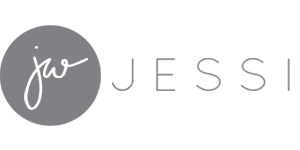 You can find neodymium magnets at most craft stores or hardware stores and those will work fine. Start with your sheet of tin. I found mine in the air conditioning/cooling section of our local hardware store and it was already mostly the right size, so I didn’t need to cut it down. 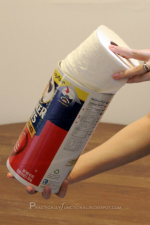 Pick out some fun paper and Mod Podge the paper onto your tin. I used two different papers, one as a basic background and one to make little lines where the cupboard shelves hit the door so I knew not to put spice tins there. I printed out the names of the spices on a sheet of clear labels and fixed the labels to the lids of the spice tins. Then I filled them up with spices from the bottles and they were ready to go! We drilled pilot holes in the corner of the sheet of tin and attached it to the back of the cabinet door with a few screws. (Yes, you can just drill through tin with a regular electric drill and a regular drill bit. We went back and forth over whether we needed something crazy, high-powered, and diamond tipped, but you definitely don’t!) We had actually bought some spray glue to use on the back as well, but totally forgot to spray it on before screwing the screws in. Oops! It seems to be staying on just fine even without the glue. Once the sheet of tin was up on the door I just stuck our spice tins to it (it was dry this time!) and now we have totally organized, totally accessible spices! Awesome! See the blue paper marking where the shelf in the cabinet hits? I love how these spices are organized: they’re neat and orderly and it freed up a ton of cabinet space! Plus these tins make it so easy to use the spices. We can shake some spices out, pour them out, or just remove the entire lid to get at bigger things like bay leaves. Yes! What’s your favorite (or least favorite) part of your kitchen? What other cool organizational ideas do you have for your kitchen? Remember the awesome pot lid holder I installed above our stove? That thing is still the best! Oh my kitchen. We’ve got that tiny one right now. Tiny stove, single sink, no counterspace, no cupboard space….. Im about to start a series about surviving a tiny kitchen. These are cute! If I had a cupboard door I would probably do it, except I would need a lot more little tins! Do you find the magnets on those tins to be strong enough? Rachel had some in our old apartment and they were always falling off the fridge, but maybe she had cheapo ones and not The Container Store versions. I love how you solved the shelf problem! I always wonder about that when putting things on cabinet doors. I ended up with two spinny spice racks and putting everything into the bottles that fit there (one is glass and stainless and one is Tupperware so they don’t match, but, whatever) since we have a little side piece of counter that isn’t particularly useable for much else. Condensing everything to fit in those two racks made a huge difference from having all the different bottles lined up, though! Plus, those bottles are big enough that I can put a pretty good bulk of spices in there for the ones I use the most frequently (I tend to buy from the bulk section at Whole Foods so I’m not buying bottles I won’t use, but sometimes I get them somewhere else and so I have a small collection of nice glass spice bottles that are screaming at me to find a use for them). My mom kept all her spices in a pull out drawer in a cabinet right by the stove, and that worked well, too. 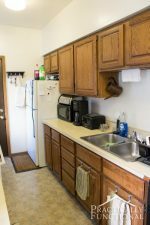 I need to tackle my kitchen now, too. It’s just…weirdly laid out and so weirdly organized. We don’t have a pantry, so I end up keeping food in the cabinets, and our dishes and Tupperware are in a different room. Most of my cooking tools are fairly well-organized now, but I need to find a better system for the food. The magnets on these Container Store tins are definitely strong enough. They are flat magnets that cover the entire back of the tin and they work great. I’m using some regular neodymium magnets I got from Joann’s on the little herb tins I wrote about on Friday, just to keep them stacked on top of each properly without falling, and they work fine as well. I suppose though, that the size of the magnet matters. My neodymium guys are pretty tiny, and they are definitely easier to remove than these Container Store guys. But if you buy a bigger size magnet maybe that’d help? And actually, truth be told, I made this spice rack ages ago and put the spices in the tins. And then we never hung it on the door. So I kept the little tins in a drawer right across from our stove and that worked better than in the pantry, but on the back of the door is still much better for us! Perfect timing for this post!!! I just spent 10 minutes looking for spices that were long used up… had I been organized maybe I could have just run to the market!!! I’ve seen these spice tins….are you happy with them? Are they worth the price? I’m totally happy with them, and I think they’re worth the price! You can definitely make your own with any tin and a magnet, but I just love these because they are designed for spices. They have the two different sized holes for pouring or shaking spices out, and the lids are clear so you can see what is inside, and when you need to refill. Love it!! I use these magnetic tins on my fridge.Thanks for linking up at Romance on a dime. Hi! I’m visiting from I’m crafty linky party. I love this idea. I was just at Ikea and was looking at those little containers thinking I need to do something with my spice rack. Thanks so much for sharing your awesome idea! What a cute idea! It looks like we were on the same wavelength! I saw your post over on Curb Alert. Very cute! Love this!! 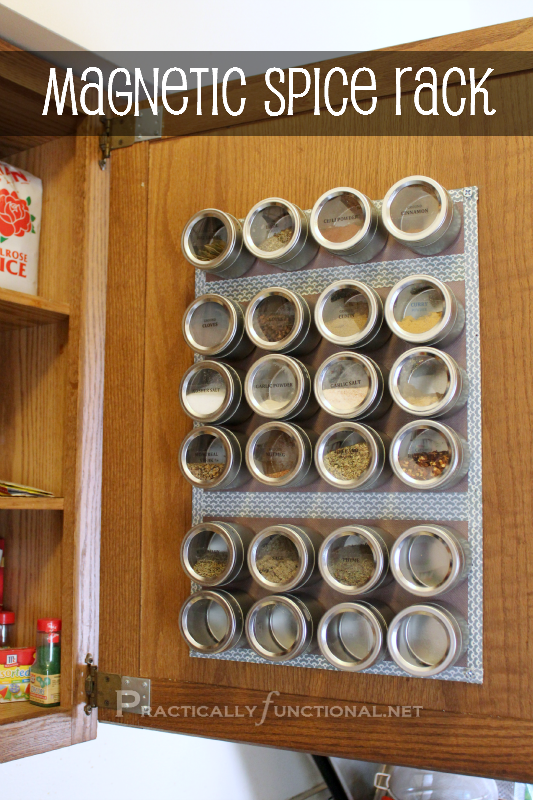 I have to look all over the place for my spices…this is a great idea! This is a great way to organize your spices. I made a spice rack for my counter to put my most used spices. The rest are in the cupboard, but I did recently organize them and printed out a list of what items are on which shelf. That makes it easier for those seldom used spices. I think this would be a definite improvement over my overflowing shoebox-full-of-spices! I would be happy to have you share this and any other idea you would like to link up to “One Creative Weekend” at OneCreativeMommy.com. Fantastic job. I need a system like this!! Great idea!! I’ve been considering doing this. It sounds like it’ll be a lot of work-but the result is beautiful! thank you for sharing! I love this idea. Makes me wish I had cabinets where I could do this but our doors are too thin. Boo! Thanks for sharing on Tout It Tuesday. Hope to see you tomorrow. Our cabinets are only about half an inch thick, we just used short wood screws and didn’t screw them all the way in so they didn’t come out the back and split the door front 🙂 You might be able to find screws short enough! Love how organized and neat this is. 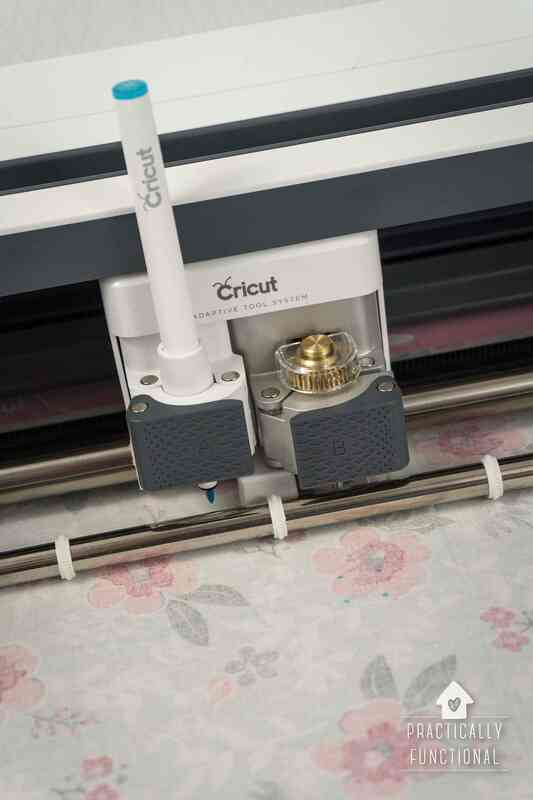 I need to come up with a similar solution, but I am such a klutz I know that I couldn’t do anything that was sideways like this…I just know I would leave a loose lid or something. Good idea. I like it. 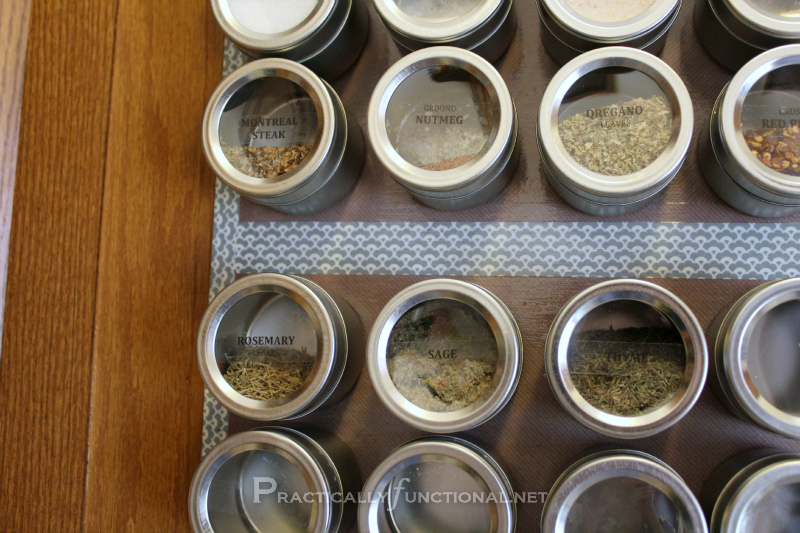 This is a great way to organize your spices. My kitchen is tiny one right now. So this idea is really helpful for me. Thanks a lot for sharing this with us. I’ll be featured your idea tomorrow on One Creative Weekend at OneCreativeMommy.com. Please stop by and grab a featured button if you’d like. I can’t wait to see what you link up this week! Wow, this is brilliant! I just gave this post a +1 on Google+. Thanks for linking up to Say G’day Saturday and sharing your great idea. I’ve seen this done with cosmetics in the bathroom too. Seems to me like you could even use an old cookie sheet. Yep a cookie sheet would work too, you’re just have to be careful if it had a lip that the cabinet doors still close! This is a great idea. I picked up a set of the metal tins for myself because a friend had them on her stainless steel fridge (and they looked good.) When I put them on my white fridge in my not-very-modern kitchen, they stood out like a sore thumb. This is a great option.